This time last week I had just returned home after a fabulous weekend at the 49th Towersey Festival, held in the Oxfordshire village of Towersey, near Thame. It’s a real family festival and many of the people I spoke to first attended when they were children and now bring their own kids. I’m still a real newbie as this was only my second time! 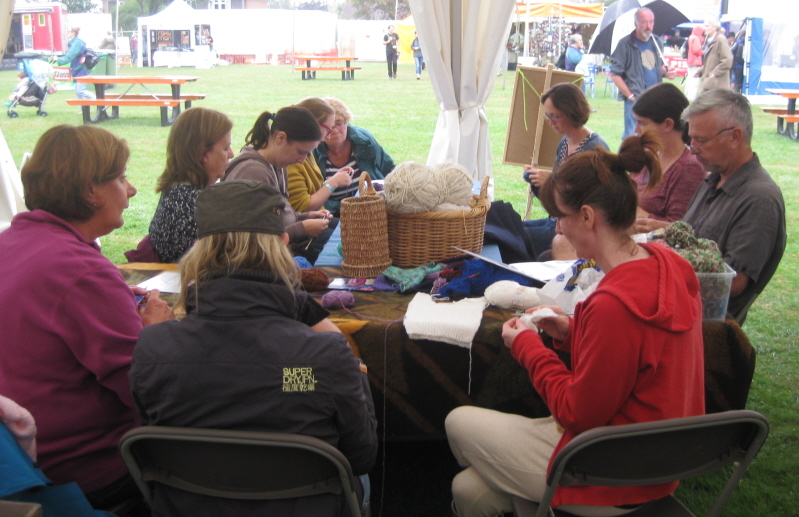 The attractions include folk and roots music, ceilidhs, international dance teams, family entertainment, crafts and- this year for the first time – a knitalong. We offered workshops to teach people to knit every morning but also invited knitters to join us to knit a few rows or a few squares at any time of the day. From the start, we were surprised and delighted by the number of people who turned up (some with needles in hand) to join the venture. 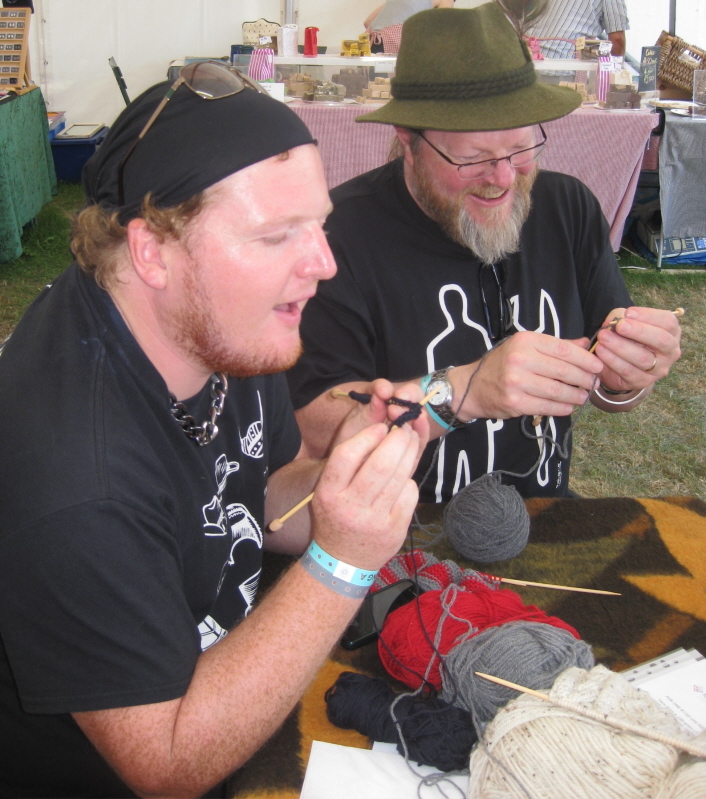 The knitting tables in the craft tent were buzzing all day and many continued to knit or crochet in the concerts – the Guardian’s reviewer of Martin and Eliza Carthy’s performance mentioned at least one knitter in the audience! 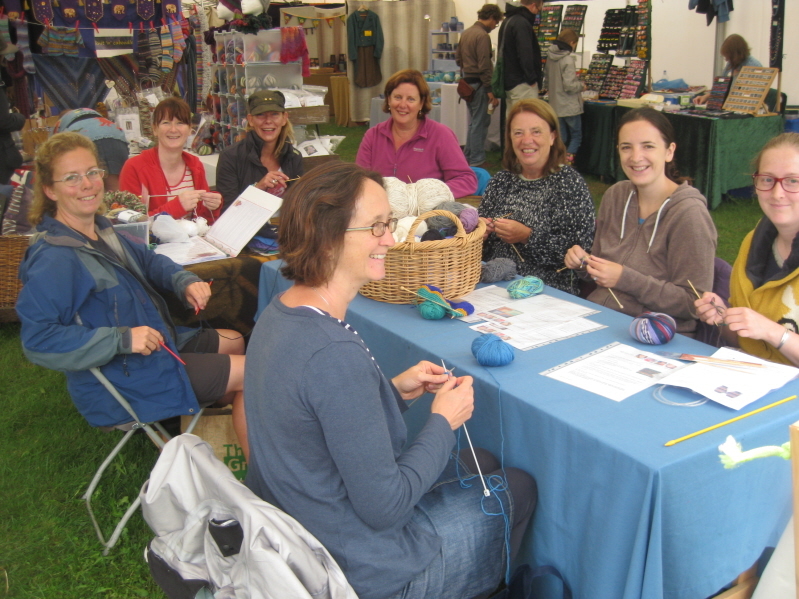 People made new friends and swapped tips and techniques – we had right-handed and left-handed knitters, continental and UK style, needles held out in front or tucked firmly under one arm. It’s probably fair to say that we had as many different techniques as we had knitters. Tensions varied considerably too – although everyone was casting on the same number fo stitches the size of the finished squares vary quite considerably so my next job is to block them all into as uniform size as possible. We also got a great mix of design from simple garter stitch squares to some very intricate caballing (thank you, Robin) and some brilliant colour work. People who had never picked up needles were willing to give it a go, including two of the Spooky Men Chorale. We’d initially hoped for forty squares over the weekend but ended up with a magnificent 90! 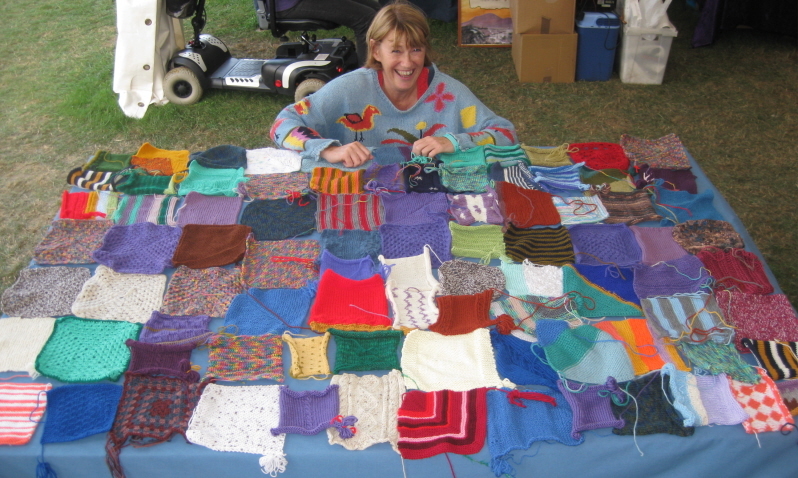 Thanks to everyone who made squares, brought wool or just offered encouragement – it was all greatly appreciated. We had such a good time that we hope to repeat it next year – we’ll just need to get more chairs!